Here is the last part of 11.03.17 walk. It was getting dark already but my camera's automatic regime still got bright photos. I read last night about these two blocks in this area: they used to be abandoned and half finished until they were redesigned and also built. This is metal which has holes in it. It's gloomy, especially with a weather like this. But I like this architectural solution. This one is waiting for its time. It looks like something from the mid-90's and the random upper edge of brick wall looks like a certain graph, maybe a financial graph of a successful company. I wonder where's the entrance: through garage? Or is it on the other side for those who don't come by car? I have seen this before, eg in Luige. It looks ugly, spoils the facade, but gives almost private entrance and some additional space (provided the apartment has two floors). One of the most typical blocks of small towns. Here I got back to the beginning of Kastani block area with this supermarket. This place was very nice. Interesting way to start with the renovation. 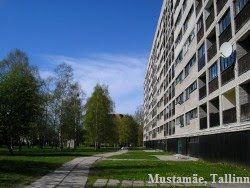 Similar to the (once-)posh building in Viimsi. Former railway station, now museum. On the way out in Uuemõisa.